It is a funny thing about Alzheimer’s that memories are lost in reverse order; memories formed recently are more fleeting than those from many years ago. Alzheimer’s disease starts in the hippocampus, the region of the brain responsible for putting experiences into memory. When the hippocampus is damaged, recent experiences never have a chance to become memories. Not until much later in the disease’s progression does it affect the regions in the brain in which older memories are stored, and so those memories are available even into later stages of the disease. Because of this, reminiscence and Alzheimer’s disease go hand-in-hand. The phenomenon described above is responsible for much of the behavior and the symptoms commonly associated with Alzheimer’s, and we need to consider its effects when communicating with and selecting activities for people affected by the disease. As an example, the photograph at the top of this page shows seven American League players from 1937’s All-Star game. including Lou Gehrig and Joe DiMaggio. An avid baseball fan with Alzheimer’s disease may remember this game and these players better than this morning’s breakfast. If your loved one loves baseball, this image would be a better thing around which to base a conversation than the mornings routine. 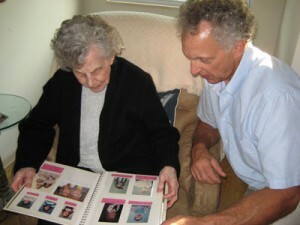 The product of reminiscence activity can benefit a family for generations to come. Reminiscence therapy is a proven way to reinforce the self-image of seniors whether they have dementia or not, one that improves quality of life. More than that, the result of reminiscing as a family can become an heirloom; a memory or even a recording of a conversation, for instance, that becomes a part of a families legacy. Many people with progressive memory disorders are much more comfortable talking about earlier memories. Because the area of the brain that stores memories long term is affected later in the disease’s progression, the affected person will know more about her life when she was 40 years younger than she knows about what has happened this week. A person with Alzheimer’s disease, for example, might have a detailed and lucid conversation about something that happened after the war (World War II or the Korean War) than what he or she had for breakfast, or experienced at the theater the night before. Reminiscing and reminiscence therapy involve reaching the memories that reside in these still viable regions of the brain. There are many ways to encourage these memories, and you should. They can be comforting, even therapeutic. A study published in the June 2007 issue of Geriatrics and Gerontology International concluded that a reminiscence group program was an effective way to enhance the cognitive capacity of people with Alzheimer’s disease and vascular dementia as well as their ability to participate in normal activities of daily living. A summary of existing data, including studies published in professional journals, and interviews with specialists concluded that the general mood and cognition improved in subjects with dementia who participated in some form of reminiscence therapy. In a strict sense, reminiscence therapy involves discussing and sharing memories, reviewing and evaluating those memories, and re-capturing the emotions and feelings that are an integral part of those memories. This process can be done one-to-one or in groups. However, when reminiscing with someone with dementia it is often better to take a less formal approach, and one-to-one can be preferable to group reminiscence, especially for people in more advanced stages. You may want to eliminate the evaluation and review part and focus on the emotions inherent in the memories. The activity should be enjoyable and nonthreatening, and talking and sharing is not even a strict requirement. Never try to force the conversation, but you may have to lead it by making suggestions, like, “Do you remember what you were doing when Neil Armstrong landed on the moon?” Props or aids are also a good way to initiate and sustain the process. It is difficult to separate music and reminiscence; not that we should want to do so. Music (music therapy) is one of the most popular and effective ways to stimulate reminiscing. A song might trigger memories of things a person was doing forty, fifty, or even sixty years ago. He might re-live a date that he was having with the girl that would later become his wife, or remember high school days and school dances. That is the essence of reminiscing. It not only exercises the brain’s memory mechanism, reminiscing also provides positive emotional feedback, which improves the quality of life. Petr Janata at the University of California has found a direct neurological connection between music and the memories that the music triggers. Music causes activity in the same part of the brain in which the corresponding memory is processed. The HBO documentary The Alzheimer’s Project, quite literally follows Woody as he wanders from place to place around the community in which he lives. Never content to stay put, he finds a place to sit, and before he has had a chance to settle in is wondering where he should go next. Told the basic rules of baseball, Woody cannot name the game, yet he whistles and sings incessantly. In fact, he occasionally sings with an acapella group, The Grunyons, that he belonged to for many years, and will even sing fairly complicated solos. He never flubs the lyric, and it is quite obvious that he is enjoying himself immensely while performing. A clip from HBO’s The Alzheimer’s Project showing Woody singing with his old acapella group, The Grunyons. The more familiar the music is, the stronger the emotional response, but even unfamiliar music seems to aid reminiscence. As reported in The Epoch Times; Mar 19, 2008 Singer-songwriter Jason Soudah was asked to provide music to accompany personal films made specifically to trigger reminiscences. He played music to fit the scenes on the film, music that was “soothing and dreamy”. The combination of music with the personal memorabilia increases the effectiveness of the visual reminders. This is part of the reason that our nature and ambient DVDs are so effective and well liked. Most are accompanied by music similar to what Soudah composes for the films and we offer a broad variety: there is a setting or a subject that almost everyone will find memorable including forests, oceans, flowers, butterflies, beaches, and many more. Bernice and I are reminiscing over some pictures of the kids, which she almost thought of as her grandchildren. enjoying a photo album of our family, which is her family, for all intents and purposes. She recognizes and loves asking questions about our children. “How’s Jackie?” she’ll ask, taking them in chronological order. “She’s fine,” Holly will answer. “And she is expecting a baby,” she’ll add. 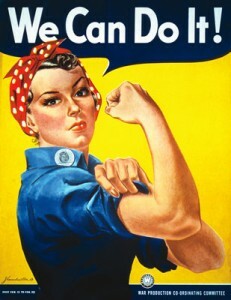 “She IS? !” is always her response to that. Then, “Is she old enough?” “Yes, Holly will tell her. “She’s 27.” “She IS? !” once again. After her surprise settles down she will ask about Abby and Christy, and we’ll get her up to date on them. Invariably she will then ask, “And how’s Jackie?” and the whole conversation will be repeated, almost verbatim. 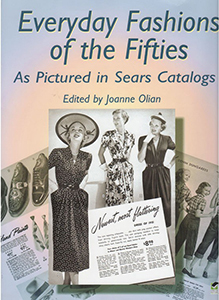 One of several books available that reprint pictures from the ’50s and earlier to invoke nostalgia. Photographs are not the only pictures that interest Bernice. She loves to look at her reprints of old Sears Roebuck Catalogs. Bernice worked for Sears when she was younger, teaching women all over the country to sew. She loves to point out the dresses and suits that she designed. We, of course, don’t challenge that. It doesn’t hurt her to think so (and who knows, maybe she did design those dresses). She also loves her picture books of babies and animals. Rachael Hale has several very fun books that show animals in different poses and settings, and Ann Geddes has become somewhat famous posing babies in colorful and interesting clothes. Some of the coffee table books have beautiful pictures of things past: old cars or airplanes, art and architecture, nature and geography, cities and countries, and countless other subjects. You can sometimes find these books deeply discounted at the larger bookstores. All sorts of sensory stimulation can prompt reminiscences. Familiar smells are particularly good at eliciting memories. We have all been transported to a time in our past by the smell of a favorite food wafting from the kitchen, or the scent of a certain flower. The fact that smells have a particular ability to transport us into our past is well known by literary figures such as Poe and Hesse, as seen in their respective works Marginalia and The Glass Bead Game. If your mother was a cook or baker, use spices to inspire memories. If your dad enjoyed woodworking, the smell of different woods will remind him of that, though these smells might be more difficult to collect. A memory book is simply a way to organize memories and mementos — photographs, stories, genealogy, significant documents, etc. Creating and completing such a book can be an invaluable life review, especially as an activity for people in earlier stages of any progressive cognitive disorder. Later it can be used over and over again to stimulate reminiscences. There are several good books that have been designed to prompt and contain memories of one’s life. They have questions about genealogy, friends, marriage and all of those things that make up personal history, and provide space to write answers as well as post photographs and other memorabilia. Blank journal books come with a large variety of decorative covers and are available at most book stores. Use one of these to create your own memory book, or use a loose-leaf binder that will allow you to add and re-arrange pages. Connie Lucas, Program Specialist at the Alzheimer’s Association, Greater Iowa Chapter, offers guidelines for creating such a book. Use Connie’s suggestions, then follow your own creativity and intuition to create a truly unique and personalized book of memories that will be enjoyed by the entire family. We searched long and hard to find our Talking Photo Album Deluxe, the perfect talking photo album for reminiscing. There are other recordable albums available, but most are limited to about ten seconds of recording time per picture. This Deluxe has 200 total minutes of recording time, so you won’t be restricted to a few seconds to tell your story. And the available time can be used as you see fit; for example, Use 35 minutes on one particularly memorable photograph, and only 5 minutes on one that elicits less conversation. Nostalgic America is only one of several beautiful books available that rely on images of our past to evoke memories. This one contains images and editorial contributed by Getty Images, National Geographic, Sports Illustrated, New York Times, Baseball Hall of Fame, NBC, CBS, ABC, as well as by various historians and museum curators. Others are more specific, like Sears Robuck Home Builder’s Catalog, or Film Star Portraits of the Fifties. We even have coloring books based on pictures by Norman Rockwell, and Saturday Evening Post covers. In some respects games are an almost ideal medium for reminiscing. This is only partly because we can adapt an almost endless amount of nostalgic material, including trivia. Through games we also employ other therapies, like sensory stimulation and art. Furthermore, games provide very positive and effective cognitive stimulation. Sato Ashida, MM, MT-BC; The Effect of Reminiscence Music Therapy Sessions on Changes in Depressive Symptoms in Elderly Persons with Dementia. Journal of Music Therapy, Volume 37, Issue 3, 1 October 2000, Pages 170–182. We were encouraged to find that the amount and quality of research on RT (Reminiscence Therapy) for dementia has increased considerably since the last version of this review (1998). We concluded that the effects of RT vary, depending on the way it is given and whether it takes place in care homes or the community. However, there is some evidence that RT can improve quality of life, cognition, communication and possibly mood in people with dementia in some circumstances, although all the benefits were small. More research is needed to understand these differences and to find out who is likely to benefit most from what type of RT. The study² by Brooker and Duce concluded that Reminiscence Therapy is more effective at producing a greater level of relative wellbeing than is General Activity (simple goal directed crafts or games). Hi John. Thank you so much for your great post! Would you happen to know of sources similar to yours that might be available in Spanish? A close relative of mine (in South America) is going through early stages of dementia. I would love to make some of the materials available to the family/caregivers, but materials must be in Spanish. Any recommendations? Thanks! Hi Claudia, We’re so glad that you found our site. Many of our materials are not language specific, like puzzles, games, and many of the alternative therapies. You might have seen the Talking Photo album. This is a wonderful reminiscence item. It has 200 minutes of talking time https://store.best-alzheimers-products.com/talking-photo-album-deluxe.html#.VXMpRkatWl4 Although the directions are in English, perhaps you could translate them into Spanish for your family. Your family would forever have memories of each photo that your loved one described. The only item we have in Spanish is a respite video/DVD, “A Visit with Maria”. https://store.best-alzheimers-products.com/entertainment-for-alzheimers/video-respite-for-alzheimers/a-visit-with-maria.html#.VXMqIEatWl4 but this is for a later stage person. Please feel free to call or write again if we can help you in any other way. Great idea! But another medium that works nicely with cookie cutters is cookie dough. There’s no reason that someone with dementia who still has the ability physically, can’t help to make and bake cookies. Cooking is a terrific and appropriate activity for many people who have dementia.